For humans, Halloween is a festival of fun! We go out trick-or-treating, we go to parties or we stay home and dig into our chocolates or other sugary treats. Sadly, lots of aspects of Halloween can pose some serious threats to our furry friends. Here are some steps to help your festivities run as spook-free as possible. Some owners won’t agree with dressing up their pets, some will. Depending on what breed your pet is, a costume may help to keep them nice and warm when they are outside. The most important factor to bear in mind when choosing a costume for your dog is: does it cause them discomfort in any way? If it obstructs their vision, their movement or their breathing, you should remove the costume immediately. Halloween might be the only time of year where we enjoy being outside in the dark. Avoid nasty accidents by keeping your pet visible to drivers, cyclists or other walkers. This is something else a costume could help with. You can also buy special luminous jackets for dogs, as well as lights to stick onto their collars. If you haven’t already, the weeks leading up to Halloween are a great time to get your dog or cat microchipped. There are lots of scary costumes, lots of noise and there will be plenty of trick-or-treaters. This might distress your pet and tempt them to run away. If your pet runs off a little too far, you’ll have a much better chance of finding them if they are microchipped. If you take your dog trick-or-treating with you, we highly recommend you keep them on the lead. Fellow trick-or-treaters might have dropped some chocolate or other poisonous substances and you don’t want your dog snaffling that! Remember that chocolates, sweeteners and raisins can be highly poisonous to our pets. You should take extra care to stop them getting to it. Store your sweets in a high place, preferably somewhere closed off by a door. Watch out for any stray sweets or pieces of chocolate that might have fallen behind the couch or onto the floor while you gave it to trick-or-treaters. Halloween is a time of stuff … and lots of it. There are artificial cobwebs on the walls, hanging skeletons, pumpkins and that’s not to mention our costumes, masks and other little trinkets. Take extra care to keep anything your pets could swallow out of their reach, particularly sharp objects. You could establish a safe zone – a familiar, clutter-free room your pet can go to with their treats and feel safe. This is another bonus of the safe zone. Perhaps choose the room furthest away from the trick-or-treaters to reduce your pet’s chances of hearing them when they come knocking. If your pet is very stressed, a therapeutic product like Vetpro: Stress & Anxiety can help to calm them. 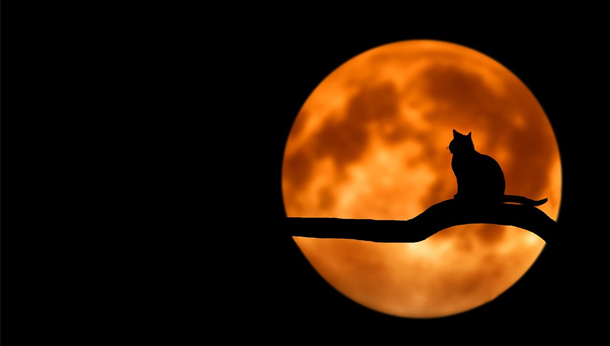 For a combination of the reasons above, it’s best for your cat to stay inside during Halloween. If they get itchy feet, you can entertain them with treats, toys and games. If you’re feeling really generous, you can try a combination of the 3! We wish you and your pets a happy Halloween! If you are worried about any of the potential hazards in this post and need some further advice, contact us today to talk to one of our vets.